You are here: Home / Bathrooms / Bathtub Repair – What Can Be Repaired & How Are Repairs Made? 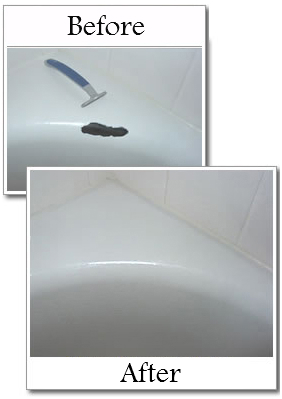 Bathtub Repair – What Can Be Repaired & How Are Repairs Made? The award winning refinishing that we at Miracle Method pride ourselves on providing to our customers can be applied to bathtubs and other units made from a variety of materials. Fiberglass, acrylic, and cultured marble are the primary materials that we can repair, but we also repair porcelain tubs and sinks, tile grout, hot tubs and Jacuzzis. Fixtures can accidentally be damaged. This frequently occurs when an item is shipped or installed, or in some cases when a heavy or sharp object is dropped onto the fixture. While everything else may be in working order and in satisfactory condition, this limited damage needs to be repaired to prevent further damage as a result (cracking or chipping are good examples of this). Sometimes a crack can develop into a leak. The good news is that fixture repair is generally speedy and inexpensive. A great deal of time and effort goes into Miracle Method’s bathtub repair. Chips and cracks must first be filed and sealed using a waterproof polyester resin. Once these areas have completely dried they are thoroughly sanded and filled. Then, using an artist’s air brush, an acrylic enamel coating is applied to the area, and the area is carefully blended into the surrounding surface, making it look just like new! Chip and bathtub repair is something that takes years of practice. DIY repair projects often only cover up damaged areas and don’t extend the life of the unit in the same way that refinishing does. 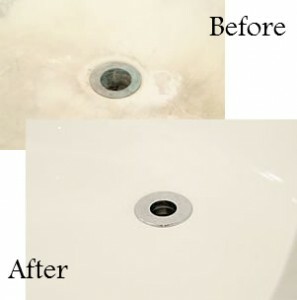 Chip and bathtub repair requires a discerning eye and years of professional experience. The good news is that bathtub repair is MUCH less expensive than bathtub replacement (less expensive by thousands of dollars!) and adds anywhere from 15-20 years, or more to the tub. If you’re considering having your bathtub refinished or repaired, then find a Miracle Method location near you or call our toll free number, 855-212-7337, to reach the nearest Miracle Method professional. DO YOU REPAIR JACUZZI TUBS? THE PROBLEM I HAVE IS A BROKEN JET FITTING ATTACHED TO THE SIDE OF THE TUB. I WAS ABLE TO REMOVE THE NUT HOLDING THE FITTING TO THE TUB BUT THE FITTING APPEARS TO HAVE BEEN ATTACHED TO THE TUB WITH SOME TYPE OF GLUE, IN ADDITION TO THE LARGE PLASTIC NUT. THIS FITTING WILL HAVE TO BE REPLACED AFTER IT HAS BEEN REMOVED. THE 1/2 INCH PVC WATER CONNECTORS WILL NEED TO BE REGLUED AFTER REMOVAL. DO YOU MAKE THIS TYPE OF REPAIR?